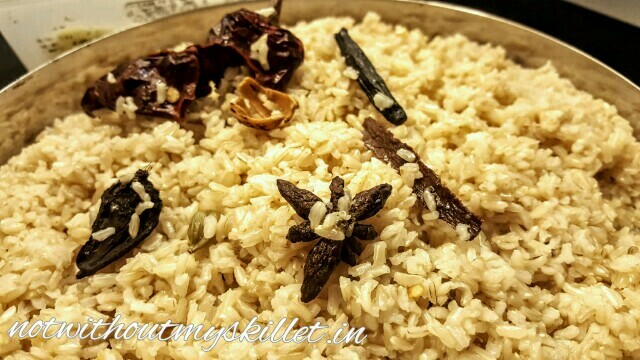 As a rule we tend to stay away from white rice and this recipe stays away from it too. This brown rice basmati chicken biryani is so high on the health factor that you might just make this one a weekly affair. Good for the heart and soul. 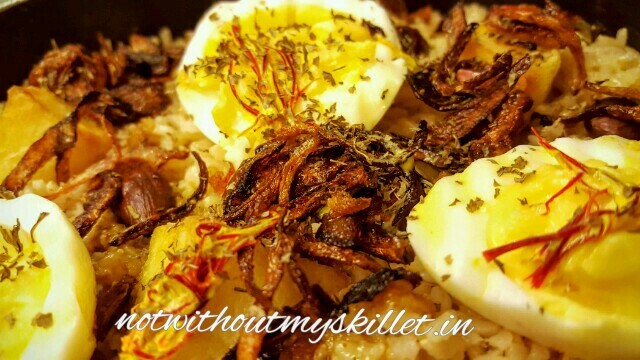 Also I make my own biryani masala, yes I have included the recipe in this post, it’s an old family recipe. 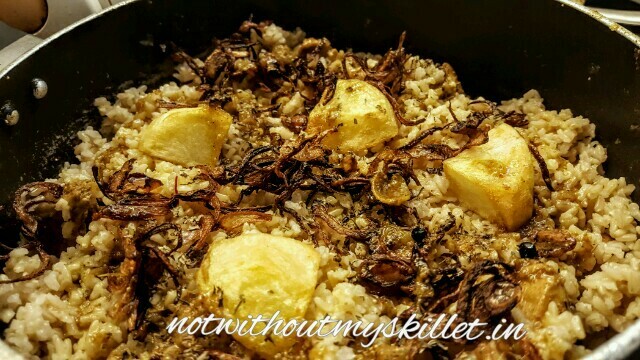 Indian food is all about the masalas and I find that though time-consuming, the homemade masalas up the deliciousness and flavours in the recipe many fold. You can use a ready-made masala too, in that case I would go with Shan Biryani Masala or Everest Biryani Masala. The recipe has been divided into various stages and I’ve segregated the ingredients as per the stage of cooking. You need to start by marinating the chicken, cooking the rice and then going on to frying the onions, almonds and potato, cooking the chicken and then finally the assembly. The dum is an important part, it’s simple, don’t let the word scare you. 2. Marinate it in the masala for at least 1 hour before cooking. You can marinate it for as much as 24 hours. 1. Use a pan that has a well-fitting lid. 2. Add the ghee and fry the finely chopped onions till translucent. 3. Add the chicken and caremalise it. 4. Add ½ cup of water and cook it till the chicken is almost done. About 20 minutes if using farm fresh chicken. 5. Take it off the stove and start assembling. 1. Add all the ingredients to the water and bring it to a boil. 2. Add the pre-soaked rice and cook it till it’s just done, should be a little hard/ resistant to break. 3. Remove in a flat dish and cool it off. 4. You can remove all the garam masala at this stage. 2. Lower layer: The chicken, do not use too much gravy, if you have extra, just pour it into another bowl. You can serve the biryani with the gravy. This keeps the biryani dry or else its to mushy for my liking. 3. Second layer: Add a layer of the fragrant rice (use half of the rice you’ve cooked). 5. Fourth layer: Add another layer of the rice. 6. Fifth layer: Layer it with the left over fried potatoes, onions and almonds. 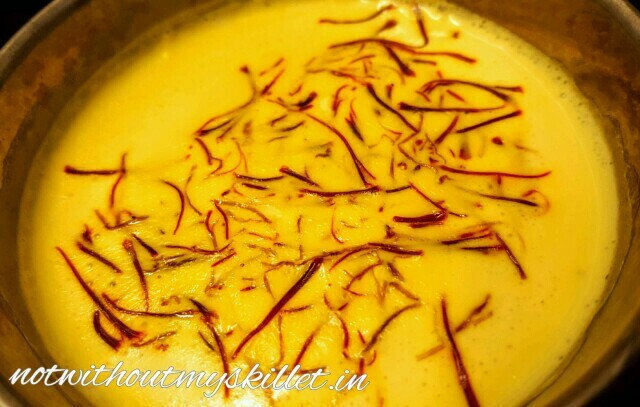 And pour some of the saffron milk on it. 7. Sixth layer: Place the eggs on the top layer and sprinkle with freshly chopped mint. The biryani has to be built layer by layer, you can add pure ghee across the layers and also the gravy from the chicken if you wish. I’ve stuck to adding saffron milk only. 1. Cover the pan with the lid. 2. Use the dough and roll it into a thin baton and stick it all across the point where the pan meets the lid. To ensure the dough sticks on, you need to dry out the pan and lid from the outside and not use any oil whilst making the dough. Once the pan is sealed, your dum is set. 1. Now cook the biryani in the pan on a low flame for at least 45 minutes. In case you don’t have a thick bottom pan, place the pan with the biryani on another skillet or tawa. 2. If you have an oven you can place it in the oven and cook it at 120 degree centigrade for 1 hour. Remember all your ingredients are cooked and you are just infusing the aromas together. 3. Within an hour, the aromas from the biryani will call out to you. Take the biryani to the table and let the guest of honour, break the dum and serve the biryani. 1. Mix the yoghurt, onions, tomato and cucumber and season it. 2. Add the mint and pomegranate seeds on top as a garnish. 3. 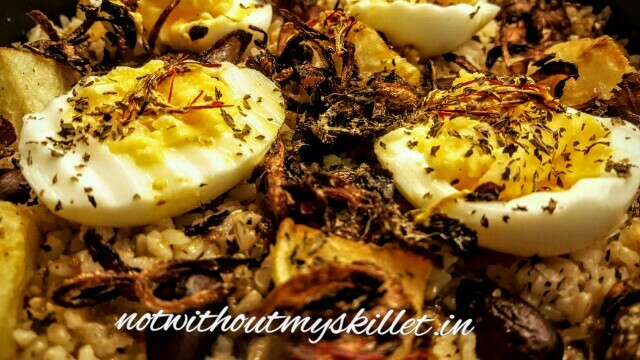 Serve with the biryani. 1. Roast all the spices in a really low flame separately (because each one has a different burn point and you don’t want your masala to smell burnt. 3. Blend them to a very fine powder. Sieve it, and blend the larger pieces of the masala again. Store in an airtight jar for up to 6 months. NOTE: I use 2 teaspoons of the masala for a pulao or vegetable biryani, and 3 teaspoons for a chicken or mutton biryani. Can’t wait to try this recipe cherry. 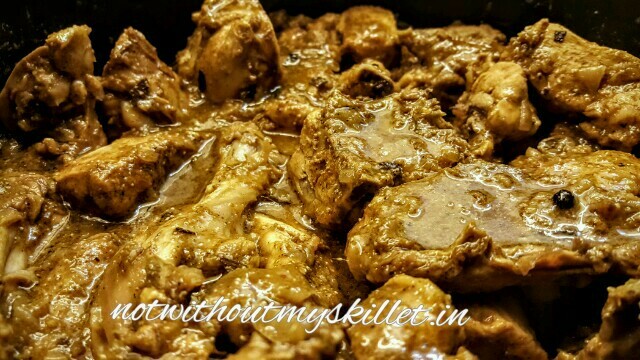 The picture of the chicken- how did you manage to get it that blackish in colour without any masala? It’s from the homemade biryani masala and slow cooking it. I use a cast iron pan, so may be that enhances the colour.